Note: A bonus post detailing some interesting bits that are coming out around the time of the Interbike trade show, which happens this coming week in Reno, Nevada. I won't be there, but anything I find interesting, I'll post here if I think it warrants it. Thanks! Hard tail mountain bikes were, arguably, brought back from the dead by the 29 inch wheel in the early 00's. Steel hard tails led the way back then, and with the advent of adventure cycling and "bikepacking", steel hard tails have reserved a special place in the hearts and minds of many off road cyclists, this one included. All my current off-road bikes are steel. Even a couple I don't even have up and running! 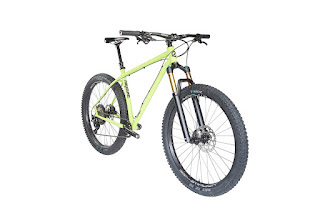 Salsa Cycles axed its venerable and long running El Mariachi model a few years ago now, and since then the crown for the best steel, mass produced hard tail 29"er has been passed around to a few companies. 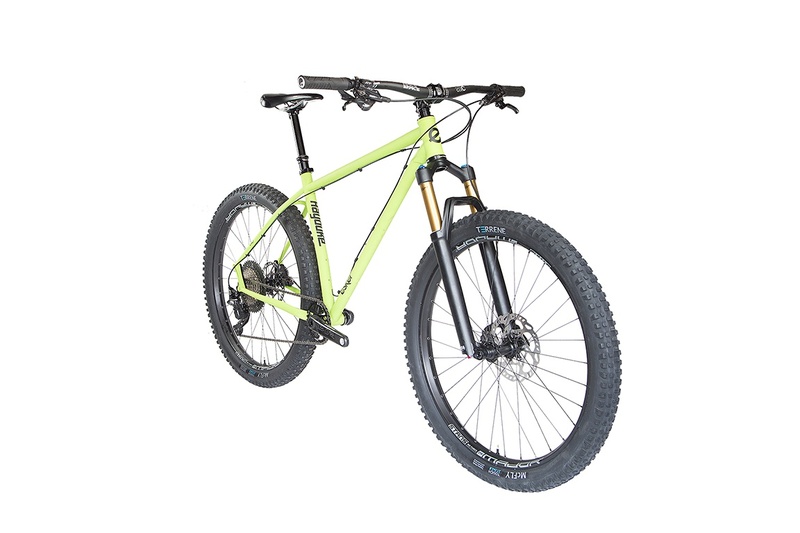 Niner Bikes came out with a revised SIR 9 a while back that most closely approximated what I felt was an "evolution" of the El Mariachi. Another contender for that was the Advocate Cycles Hayduke model. But then the company, and its bikes, sort of faded away. However; recently the folks behind Advocate have revised their business model, canned Advocate, and re-branded and launched a new company called "Esker Cycles". They brought the Hayduke over, albeit a new Hayduke with some new frame tubing and minor geometry tweaks. Since this has the closest relationship, via one of the company's principals, to the old El Mar, I would say that the successor to the El Mar has to the Hayduke, a fully modern steel hard tail. A choice of two swappable rear drop out plates, multi-wheel size and drive train capabilities, and a price for the frame, rear through axle, Wolf Tooth head set, and seat collar at $675.00 make this look pretty attractive. Completes will be offered starting at 2G. Pretty cool. Plus, it is supposed to be lighter and more responsive than the original Hayduke. See Esker's site linked above for more. 45NRTH is kind of a funny company when it comes to its naming conventions. Their tires are often named after obscure black metal bands or old Minneapolis area punk bands. Their boots get renamed every time they offer an evolution on the old design. Yeah........so, think of this as the latest version of the Fasterkatt, only with several design changes and upgrades. The last model, which supplanted the Fasterkatt, was the Japanther. This, the Ragnorok, would be version three, if I am counting correctly. Anyway...... The Ragnorok features a move to the BOA closure system and a rubberized, neoprene upper "sock"which has been redesigned as well. The silver edition, shown here at left, is fully reflective and will retail at $235.00. A non-reflective, black upper model is offered as well at $195.00. The soles, by the way, look like a dead ringer for my first edition Fasterkatt's, so apparently no changes were made there. SKS is a German based company best known for inflation devices and fenders. They make a full line of fenders which are well known in certain cycling circles. Being introduced at Interbike this year, and available at dealers in November, is this new Bluemels 65mm fender suitable for 29"ers. SKS claims the front fender is 680mm long and the rear is 920mm long. MSRP is set at $74.99. The only image I got was of what looks like a rear fender. You can make out some wide clearanced stays and what appears to be a rubber edge on the end of the fender itself. If this is indeed a rear fender, I would judge from the image that coverage is not all the way down the back, so perhaps this is meant more for mountain bike/off-road use. But that said, it might be a handy design for bikes like Fargos and the lot which are used across a wide range of terrains and in varying conditions. I could see this being very useful for early season "sloppy" gravel rides or for those commutes where run-off from daytime melting is a concern during Winter. SKS is also introducing a foot pump. I see another inflation device selling company is also doing a foot operated bicycle pump. Maybe this is a new thing for the near future. Ditch that old floor pump with a handle and tall profile that is so tippy! Use your feet instead! Ha! Well, to be fair, when I was a younginz, these types of foot operated pumps were still around. They were a relic even back then, but apparently the idea is being revived for 2019. I had a 2012 Mariachi and thought they had engineered out the natural ride quality of steel, hopefully the Hayduke doesn't have that same aluminum like ride feel that the later El Mars had. I guess I better hang onto my Advocate snap back, it might be worth a $1 in 50 years.